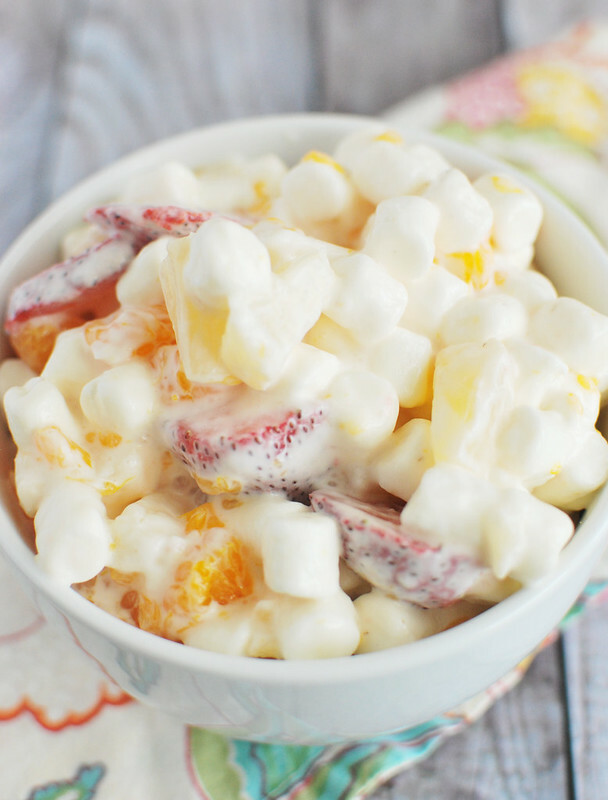 Marshmallow Fruit Salad – the BEST fruit salad recipe! 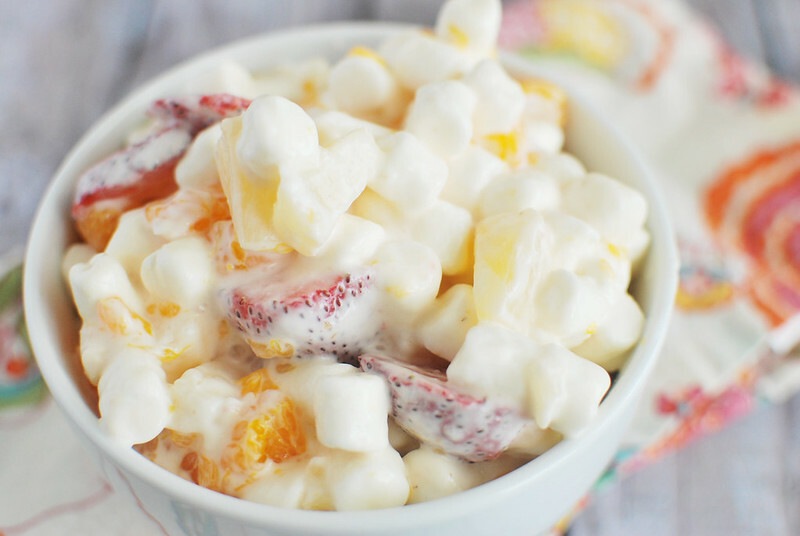 Pineapple, mandarin oranges, strawberries, and marshmallows in a creamy dressing. Only 5 ingredients! I know it looks like I showed up with a bowl of marshmallows today, but I swear there’s fruit in there too. My oldest started talking about fruit salad as soon as our weather warmed up. My kids eat fruit all day long but for some reason, he wants it cut up and tossed together. In an effort to become the favorite parent while my husband is deployed, I threw in some marshmallows. I have to admit, 2 out of 3 of my kids wouldn’t eat it. Like, wouldn’t even try it. But the one that requested fruit salad has been having some with every meal and continues to rave about. And btw, what kind of kid turns their nose up at what amounts to basically a marshmallow salad? It’s super simple, uses mostly canned fruit, and then you can throw in whatever fresh stuff you happen to have on hand. I think bananas would be extra delicious in this but I also think they would get pretty brown and gross if you try to refrigerate them for awhile. Grape Salad – this is my alltime favorite fruit salad. Red and green grapes tossed in a sweet and tangy dressing with brown sugar and pecans on top! Watermelon Tomato Feta Salad – a savory fruit salad! Watermelon, tomato, cucumber red onion, and feta in a citrus dressing. Pina Colada Fruit Salad – grapes, blueberries, strawberries, and pineapple in a pine colada dressing. This is summer in a bowl! 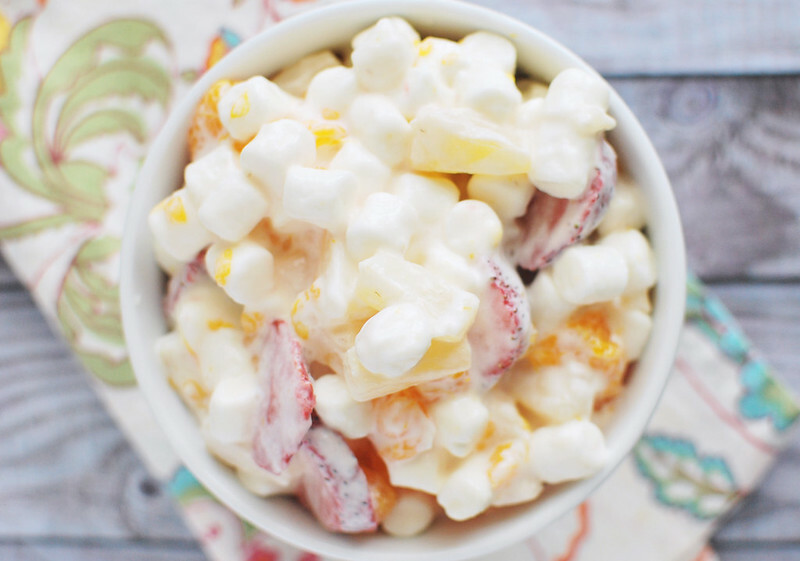 Gentle fold all ingredients together until all the fruit and marshmallows are covered with sour cream. Allow to sit in the refrigerator for an hour before serving. 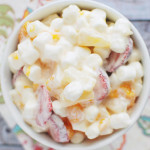 12 Responses to "Marshmallow Fruit Salad"
Most beautiful fruit salad of all time!! My aunt makes a salad a lot like this! Definitely was a staple for summer gatherings! My family makes something similar. Price would die for this. He loves salads like this. And askes for ambrosia as well. I don’t get it tho so he just buys it. But I could totally get behind this! we made this back in the 70’s often my mom would make it with fruit cocktail mix and would add in dry coconut. the longer it sat in the frig the better it got. I would say this is as good as it gets! Now I want some. You made my taste buds remember LOL! My mom made this when i was a kid. My cousin Randy always requested this at family gatherings. She used to put apples, grapes,and bananas in it along with the oranges and pineapple. They help keep the bananas and apples from turning too soon. You could always just add some when you dish it up. I have a Pistachio Ambrosia recipe that my husband loves! My sister used to buy it from the grocery store deli. In lg. bowl mix both pineapples with juice, sprinkle pudding mix all over pineapple, mix gently. Let stand for 3 minutes, combine everything else and mix. Refrigerate for at least 2 hours before serving. I hope ya’ll like it! I make a very similar salad with a few twits. My recipe calls for green seedless grapes, cut in half, pineapple chunks, and mandarin oranges. Then you add the marshmellows. The difference is you add equal amounts of sour cream and mayo. Mix the dressing well and then add 2 tsp. of white sugar. Blend into the dressing well. Add coconut and then combine and fruit mixture and the dressing. This salad is best if it sits in the frig for at least 2 – 3 hours. Everybody’s favourite hear.